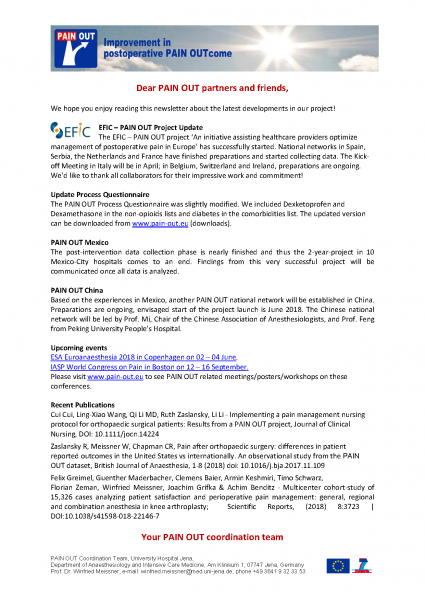 PAIN OUT is an international quality improvement and registry project that provides a unique and user-friendly web-based information system to improve treatment of patients with post-operative pain. Participating hospitals collect patient-reported outcome data as well as clinical data in a highly standardized way, using a questionnaire available in more than 20 languages. After input of data, hospitals receive online feedback and can compare their results with other participating hospitals (benchmarking). Evaluation of these results helps identify deficits so that improvements can be implemented. 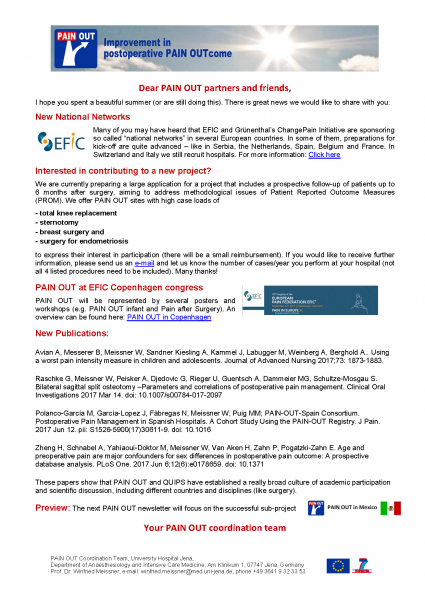 From 2009-2012, PAIN OUT was funded by European Commission's 7th Framework Programme (Grant Agreement no. 223590). Since end of EU funding, participating hospitals have to pay a moderate annual fee for the services provided by PAIN OUT. Click here for the newsletter about the Process Questionnaire Update. On 01 April 2018 IMI-PainCare, a new IMI project aiming at improving pain management started. IMI-PainCare will closely collaborate with PAIN OUT. Enjoy reading our latest newsletter! Deadline for Poster Abstracts is on 12 March! A recent publication - Pain after orthopaedic surgery: differences in patient reported outcomes in the United States vs internationally. Last week, the PAIN OUT application was updated and moved to new servers. We now have an improved user experience and exciting new features. Please be aware that both data entry and benchmarking are now at the same location. Main topic of this newsletter is the successful national network in Mexico.